← New Adult Nonfiction–Challenge Yourself! Chloe Mills is living every high school student’s dream. She’s in Greece with her best friend in a summer volunteer program. She and Angie rarely argue, but after a disagreement with Angie, Chloe decides to do some sightseeing by herself. She’s grabbed, thrown in a van, blindfolded, and drugged. Later, she’s taken on a plane. Yes, she’s been kidnapped and has no idea what country she is now in. Chloe’s fear is both rational and irrational–to avoid a spoiler, I’ll just say that she sometimes has reason to be very afraid and that she suffers, but–weirdly–she is also treated much better than she could have imagined by one of her captors. He visits her with some regularity, is a good cook, and is concerned about her well being. She begins to idolize him, reading much into each thing that he does. She’s suffering from Stockholm Syndrome, a state of mind in which a hostage comes to identify with his or her captor and may even believe that s/he is in love with that captor. We (and Chloe) learn very early in the novel that she is being held in an effort to have prisoners released. She’s in this for the long haul, and is never sure what fate awaits her–death, torture, release? 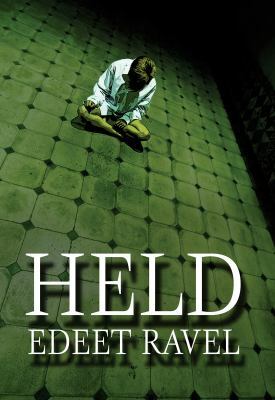 High school housekeeping: Held is a quick, easy read, but in a short narrative space, it creates a very detailed and complex look at Stockholm Syndrome. Not only can you see how Chloe would start to think about her captor as her love interest; as you learn more and more about her captor’s life, you, too, wonder if he’s such a bad guy. And you feel very weird about this as you read, asking yourself, “Am I being fooled, too?” The addition of Facebook posts, news articles, and a “Free Chloe” website at the end of chapters help the reader understand how friends and Chole’s mom are dealing while they have no idea what is happening to her. As this is an easy read (middle school reading level, but with high school students as its intended audience), I recommend it for struggling readers. But it’s a quick, fun summer read for others as well, worth the afternoon it will take you to become absorbed in Chloe’s story. This entry was posted in Fiction, Hi-Low/Quick Read, Human Rights Issues, Romance, Young Adult Literature and tagged book reviews, Edeet Ravel, friendship, Greece, hi-low reading, human rights, infatuation, kidnapping, post traumatic stress disorder, prison, PTSD, reluctant readers, romance, Stockholm Syndrome, YA fiction, YA literature. Bookmark the permalink.